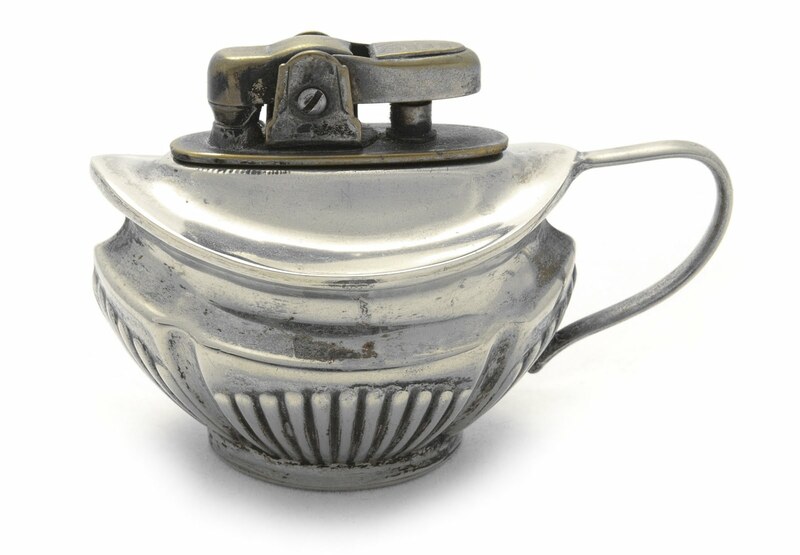 This small wick table lighter was made in 1950 in Birmingham (47-48 Frederick St.), England by Mosda. Mosda was a middle company (approx. 125 employees) founded by Moss Davis in 1948. It went into liquidation in the 1969. The company produced lighters, office items such as: stapling machines, hole punchers, propelling pencils and pencil sharpeners. Both the lighters and the office equipment were sold through various wholesalers and tobacconists throughout the UK and were exported throughout the world. Both the base of the lighter and the removable lighter insert were made of brass and then silver electroplated. There are at least three different models of the Period Series known (different decoration, e.g. Georgian with embossed pattern). Many thanks to Lawrence Mosda for the info on the company!